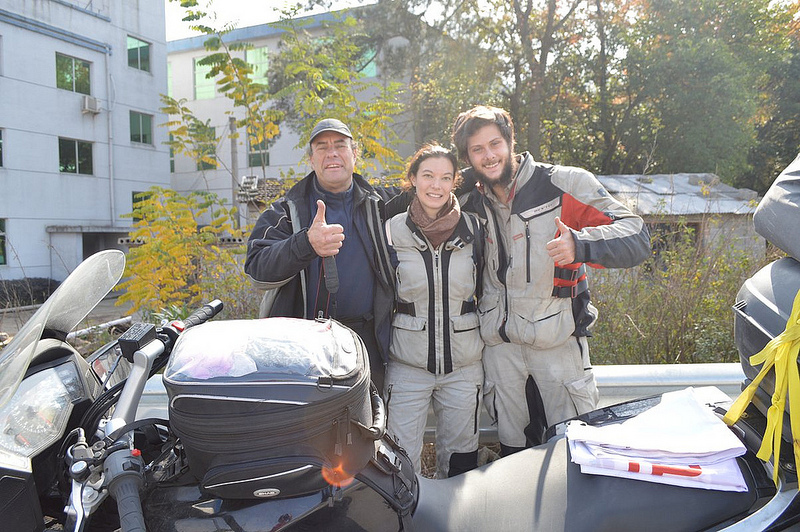 My boyfriend Buck and I recently completed a 146 day journey around China, visiting every province, on the back of a motorbike. Now, I don’t actually ride motorcycles myself, so a large proportion of my days were spent facing Buck’s back. However, I did have duties: I was “chief navigator”, picture taker and videographer. If I wasn’t doing one of those three things I was probably listening to my e-books or otherwise daydreaming or possibly cat-napping (oh yes, it can be done). However, amid my many duties and distractions I still found time to gaze out at our often breathtaking surroundings and marvel at this amazing adventure that we were on. Rewind to the start and why I decided to undertake this journey in the first place. Ever since coming to live in Beijing in 2010 I’ve been fascinated by traditional Chinese architecture. I love visiting the Summer Palace, trekking unrestored parts of the Great Wall and visiting the old parts of Beijing with their siheyuan (四合院), courtyard homes. However as with many interests, life can get in the way. I was working as an architectural consultant for a Chinese property development company, and whilst my holiday allowance was more generous than your standard 10 days, it wasn’t enough to see everything both Buck and I wanted to see. After two and a half years we had decided we needed to see more. What if in the next year or two we moved back home but hadn’t strayed beyond the east coast of China? 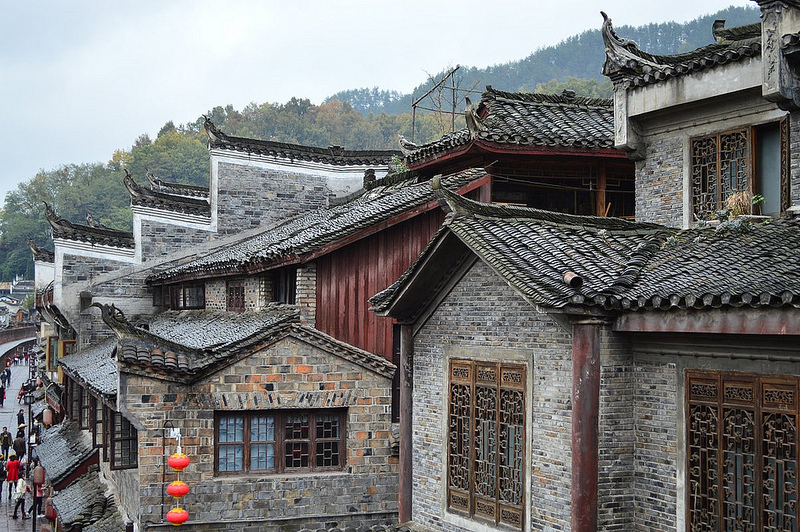 Of particular importance to me was of course being able to explore the different traditional forms of ethnic minority architecture, and in China there are 56 (recognized) ethnic groups. So we started planning in early 2013 and before we knew it a one to two month trip had snowballed into a 4-5 month undertaking… as these things are wont to do. 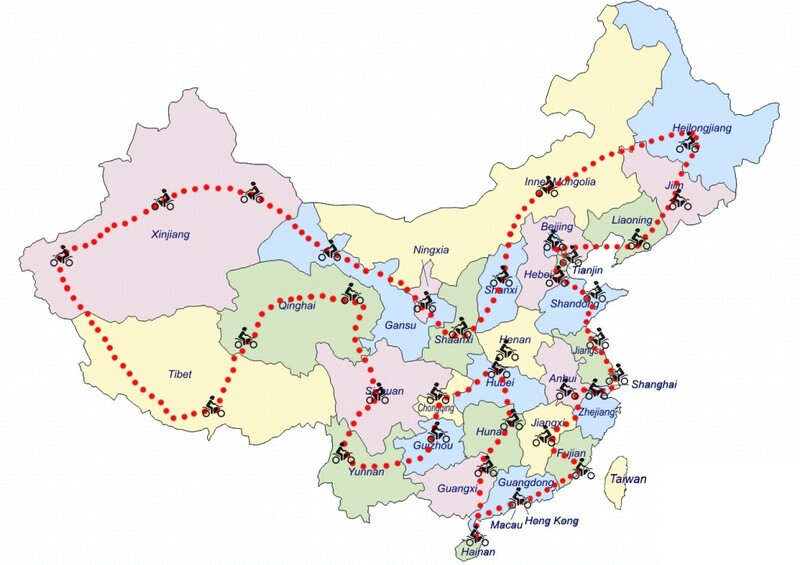 The new and improved plan included visiting all 33 provinces in China, teaming up with a Chinese charity, finding a main sponsor and several partners and attempting to break a Guinness World Record for ‘longest journey by motorcycle within a single country’ (for which we are now officially recognized http://www.thegreatrideofchina.com/great-ride-china-officially-breaks-world-record/). Our journey took us anti-clockwise around China starting out in Beijing on the 19th of June and ending up back there on the 11th of December. We started out heading north towards Heilongjiang, then rode through the Inner Mongolian grass plains down to Shaanxi, on to the vast, arid landscapes of Gansu and Xinjiang in the North-West, then entered Tibet and on to the Himalayas and Mt Everest base camp. After Lhasa we went up to Qinghai, then down south to the lush sub-tropical climate of Sichuan and Yunnan, visiting the islands of Hainan, Macau and Hong Kong and then on to Fujian and Zhejiang, the birthplace of our trusty CFMoto 650-TR bike. All the while we were dipping in and out of central China, criss-crossing around the Yangtze River in order to hit all 33 provinces. Finally we zig-zagged our way back up via the industrialised East coast back to Beijing. On the road we were met with sandstorms, snowstorms, endless days of wind and rain, hundreds of miles of muddy, potholed, gravelly, sandy and rocky dirt roads as well as huge amounts of road construction, which was basically the same thing as the dirt roads but with the added bonus of navigating around heavy machinery and road blocks. We travelled from one of the lowest points on earth with temperatures of 40C to one of the highest places on earth with lows of -4C. 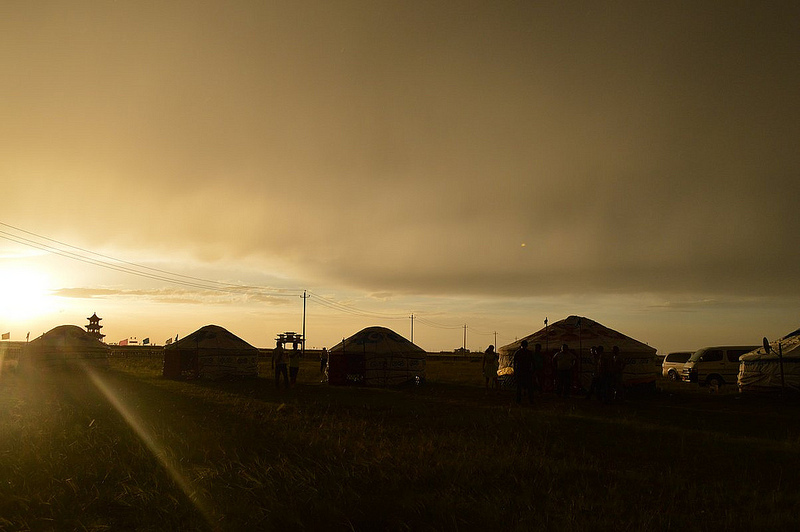 We encountered some amazingly friendly people, camped amid breathtaking landscapes, explored ancient history, tasted delicious foods, observed beautiful sunsets and made life-long friends. 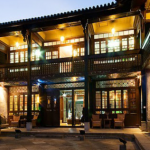 It would be impossible to write about each varying style of architecture that we came across or each ethnic minority style house that we stayed in, in a single article. I will therefore be writing regular articles throughout the year on these experiences on the CBR site. Readers can also sign up to a free monthly newsletter, giving them full access to all these articles and more! So to get us started I’ve added brief outlines of some of the architectural highlights of the trip, to be covered in more detail on the website. In our first two weeks we headed north-east towards Heilongjiang (黑龙江) and then entered Inner Mongolia (内蒙古), making our way back down again towards Shanxi (山西). 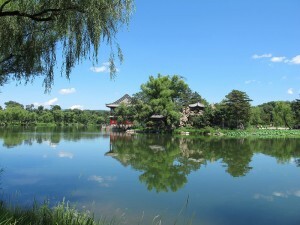 On our second day we visited the Mountain Resort in Chengde (承德), a Qing Dynasty imperial retreat not dissimilar to the Summer Palace in Beijing both in purpose and architectural style. Traveling through Liaoning (辽宁) and Jilin (吉林) province and experiencing some of the best and worst roads of the trip respectively, our next cultural destination was Harbin (哈尔滨) in Heilongjiang. Giving ourselves another half day off we explored Saint Sofia Church and the large city square and wandered along the European influenced streets dotted with Russian colonial architecture. 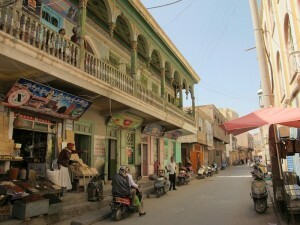 Our next stretch was entering Inner Mongolia and reaching one of the most northern cities in China, Manzhouli (满洲里). Being a border city with Russia and China’s busiest land port of entry, Manzhouli was certainly unique. If Harbin was the older, more grown-up representative of classic Russian influenced architecture in China, then Manzhouli was it’s younger, more superficial kid brother (who might well have an attention deficit disorder, but I don’t like to speculate). 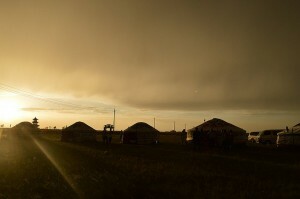 By the end of our second week we found ourselves on the Inner Mongolian plains, resting up in a traditional yurt whilst an amazing storm raged around our temporary structure. From Inner Mongolia we made our way down to Shanxi (山西), home to the ancient walled city of Pingyao (平遥). What I liked most about Pingyao was actually all the old merchant houses and temples on the outskirts of the city, well-preserved but not overdone and virtually empty thanks to the Ancient City stealing all the limelight. From Shanxi to it’s neighbouring province Shaanxi (陕西) and one of the ‘oldest cities in China’, Xi’an (西安). Visiting the Terracotta Army is of course a must, and on a side note I have to say they didn’t do a bad job with the tourist centre, it’s rather tastefully done. We also visited the famous and well-preserved old city wall, one of only a few city walls left from the Ming period that have remained largely intact. From Shaanxi it was on to Gansu (甘肃) where one afternoon whilst traveling along a small mountain road we stopped for a break near the owners of a yaodong (窑洞) – cave home. Still very much used in this area these dwellings are either carved into the soft sand stone mountains or part of a sunken courtyard, the second being the type we were shown around. Once we entered Ningxia (宁夏) there was a distinct shift in architectural style from Han to the Muslim ethnic minority Hui. All of a sudden we were seeing mosques dotted around the countryside with local men dressed in long white robes gathered outside in groups exchanging news or playing card games. Day 33 we visited the most western section of the Great Wall at Jiayuguan (嘉峪关). At this point you really feel like you’re in the desert and the ancient remnants of the earth and compacted reeds earth-wall add to this feeling. Day 37 we entered province number 11, Xinjiang (新疆). The largest administrative division in China holds a lot of architectural variety, being home to several ethnic groups including Uyghur, Han, Kasakh, Tajiks, Hui, Kyrgyz and Mongol. We had an unplanned rest week in Kashgar which was a great opportunity to explore the mosques, bazaars and Old Town which unfortunately seems to be rapidly disappearing. 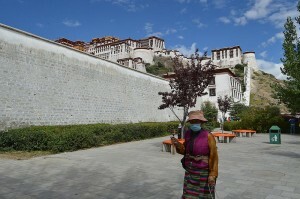 Traveling around Tibet (西藏) was without a doubt one of the highlights of our trip. Tibet is vast and largely deserted, so any village that we passed by or stopped at for the night was full of traditional Tibetan architecture. 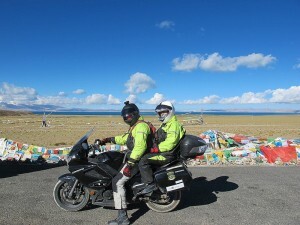 With the majority of Tibetans also being buddhists there was no shortage of temples and monasteries to explore, all set in breathtaking natural surroundings. Once we reached the city of Lhasa (拉萨), Ciren, our guide whom we’d had for the entire section of Tibet (a requirement for any foreigners wanting to enter Tibet), gave us a very informative tour of one of the most sacred sights for Tibetan buddhists the Jokhang Temple. We also wandered through the old parts of town and had a tour of the famous Potala Palace, residence of the 5th to 14th Dalai Lama. 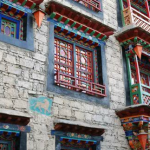 Last but not least we visited an admirable example of building restoration at the House of Shambhala, a geo-tourism hotel in the heart of Lhasa. 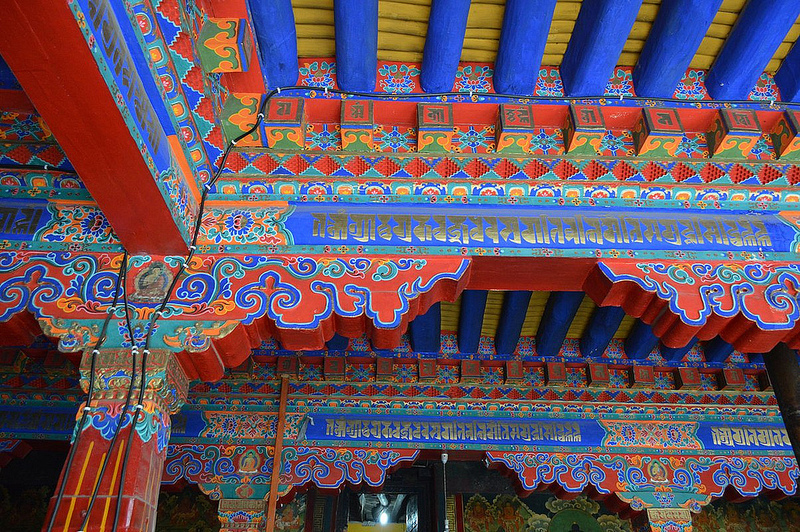 However our tour of Tibetan architecture didn’t end with us leaving Tibet. Much of Western Sichuan (四川), on whose narrow mountain roads we spent the best part of a week, was home to many Tibetans and their native architectural styles. On day 85, one day before reaching the city of Chengdu (成都), as the sun was setting we pulled over on the side of the road and took a local Tibetan family up on their offer of staying overnight in their 4-story farmhouse home. With 25 out of the 56 ethnic groups found in Yunnan (云南), this province has a huge amount of diversity amongst it’s local architecture. We visited both Lijiang (丽江) and Dali (??) Old Town, both popular tourist destinations for their local Naxi (纳西) and Bai (白族) influenced culture and architecture, respectively. 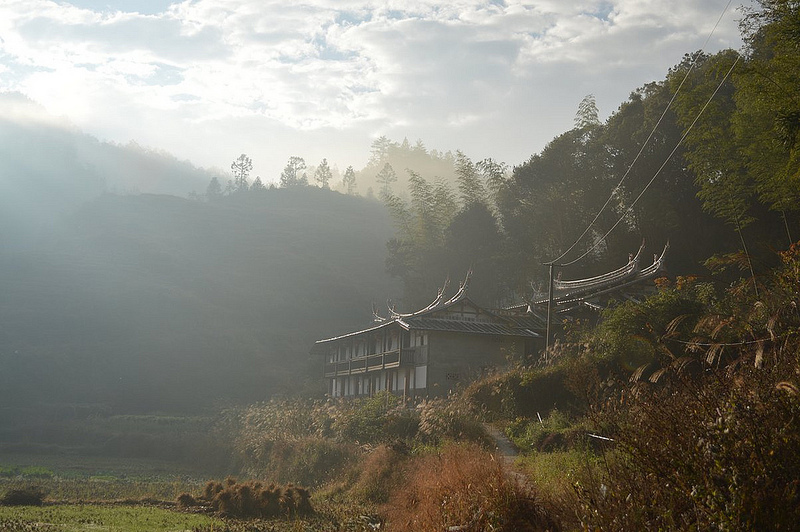 We were also lucky enough to visit Xizhou (喜洲), a Bai ethnic minority merchant’s village outside of Dali. Away from the crowds we wandered through the village which has remained largely unchanged for centuries, and also had a tour of the two Linden Centres, both great examples of outstanding restoration projects. From there it was on to another historic old town called Fenghuang (凤凰) Ancient Town in Hunan (湖南) province. 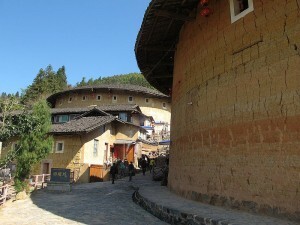 Here we were able to explore another form of ancient architecture, that of the Miao (苗族) people. For the last portion section of our trip we experienced a mix of architectural forms. On the island of Macau (澳门) we wandered along the Portuguese influenced cobbled alleyways lined with colonial relics. I was pleasantly surprised by the European influences of Macau, a place best known for being China’s only gambling destination. However we did also take a trip along the historic casino strip and look in at the Grand Lisboa. Well, “when in Rome”! After our visit to Macau and Hong Kong we moved on to Fujian (福建) province and toured the magnificent rammed earth structures called Tulou (土楼), belonging to the Hakka people (客家人). The Hakka people are actually part of the Han Chinese but speak the Hakka language. 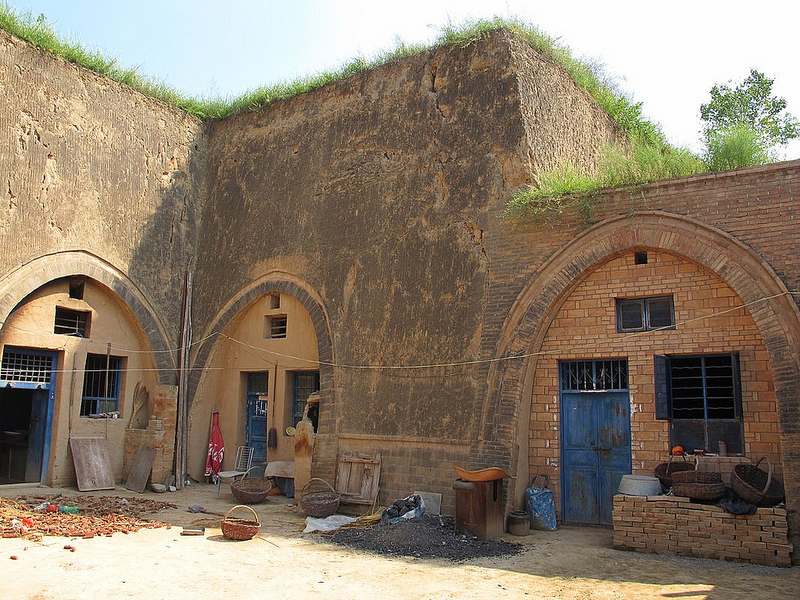 It is believed that these people originally migrated south from the Yellow River basin, and it is speculated that this might be why their earth buildings are constructed like fortresses. Many of these fortified structures were built to house an entire clan or extended family, sometimes up to 100 people in one house. Our last cultural stop was in Yangzhou (扬州), home of many pretty water garden homes done in the Suzhou (苏州) style in Jiangsu (江苏) province. Biking with a friend from the former Chinese capital of Nanjing (南京) we stopped off at a beautiful garden home belonging to a Qing government official, bringing us full circle in our architectural tour and a fitting end to The Great Ride of China. We covered a lot of ground on our 146 day tour of China (pun intended), so I will be re-visiting all of the above mentioned in more detail over the course of the next few months on the website. 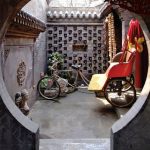 If you’d like to follow along with the more in-depth posts covering the unique cultures, architectural styles and examples of building preservation that make up China’s diverse heritage, then sign up to the CBR newsletter! I am overwhelmed by what you did and how inspiring it must have been. Can’t wait to hear and see more.